​Ed Gendron is an independent artist, photographer, and filmmaker who currently resides in New Haven, CT. He grew up in Martinsville, VA and received his MFA in Film and Photography from Redford University. Initially a painter and printmaker, Ed was inspired by the stories of people whose portraits he painted, so he embarked on documentary film and photography as a way to connect with people and tell their stories. 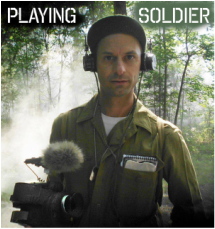 Most recently, he has documented WWII reenactors in the American South, Northeast, and Midwest culminating in a series of photographs and a feature length documentary film called Playing Soldier (2017). His photographic work has been selected for juried exhibits at University of North Florida, Eastern Carolina University, and the Durham Arts Guild.